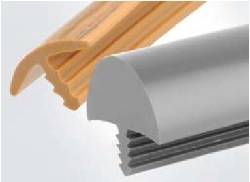 PVC Edgebanding is noted for its wide variety of color matches to Laminate and Melamine board manufacturer. Standard sizes are 15/16" Wide .018" Thick and 600 foot rolls. Depending on the manufacturer it MIGHT be available in 1MM, 2MM, 3MM Thick and up to 1-5/8" Wide. This product is typically put on with a Hot Melt Adhesive and an "Automatic" edgebander. Preglued is also available on thin product and you can use a Hot Air Edgebander to apply it. Ironing this product on is not recommended. Thin .018 is good for drawer boxes and light use edges. 1MM, 2MM and 3MM are good for door edges and countertop edges or anywhere you will get heavy use. Countertop edges are well suited to 3MM product as it is very resistant to abuse. Thin (.020") Wood Veneer Edgebanding is offered as unglued fleece backed, Pre-glued (Iron On), Prefinished and Pre-glued and Prefinished. Nominal thickness is .020” or .5MM. Other thickness include 1 MM, 1.5 MM, 2MM and 3MM. Some of the standard widths we stock include, 22, 28, 32, 35 and 44mm (US 7/8", 15/16", 1 1/8", 1 1/4", 1 3/8", 1 3/4"). Standard roll length for unfinished and finished is 500 feet, Preglued and Preglued and Prefinished is 250 ft.1 MM 1.5 MM 2MM and 3MM roll lengths are 328 feet. 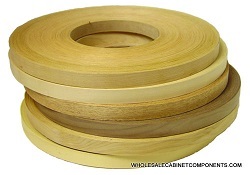 Preglued Wood Veneer Edgebanding can be ironed on with a household iron set to Medium/High or a hot air edgebander. 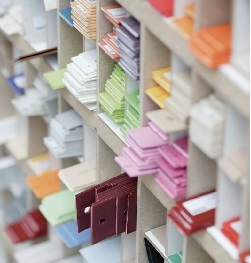 Melamine is a low end paper based product with limited color availabilty that can be ironed on. Quick and easy but not very durable.